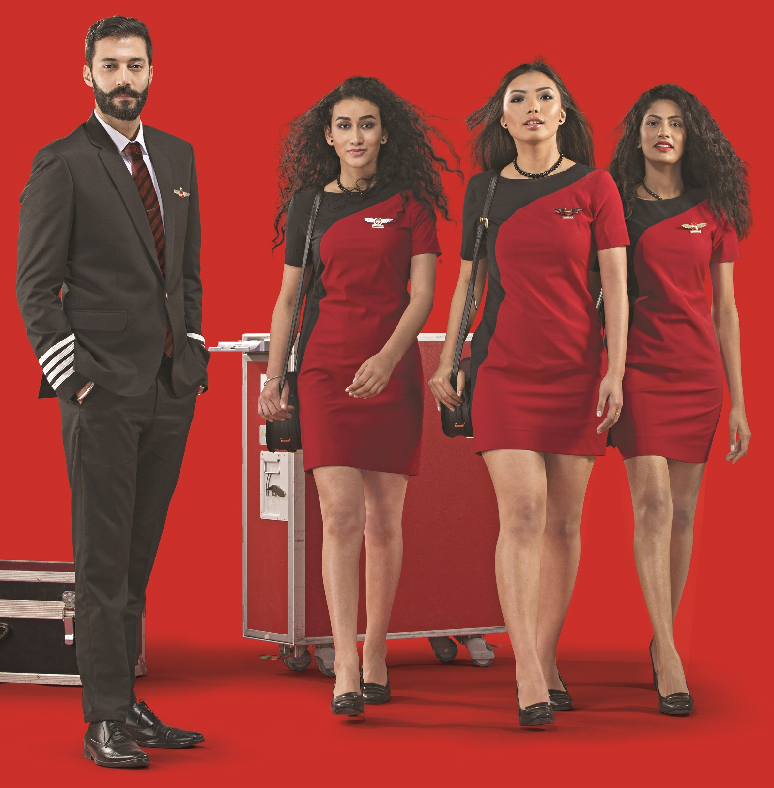 SpiceJet said it is giving its staff an image makeover with a “Redder, Hotter and Spicier” new uniform starting today. “The uniforms retain the carrier’s signature red colour largely while incorporating some unique and flamboyant designs to infuse boldness and style,” it said. The new dress code has been created by SHIFT, a design house based in Mumbai. Promoted by the celebrated designer Nimish Shah, Shift has been associated with several industry awards including Vogue India Fashion Fund & Grazia International Next Glam Award. SHIFT’s clients include Sonam Kapoor, Deepika Padukone, Kalki Kochelin, and Freida Pinto among others. The dress is a combination of red and black, and largely along expected lines for an airline, despite what the company claims. However, there will be different patterns for different seasons and climates. “The new range includes a unique design for each department specifically stylized to suit the different seasons and time periods like summers, winters etc. “For instance the summer wear for the female cabin crew will include a one-piece dress. They will be attired in a short shift dress, cut and sewn and detailed with accessory elements like a sling bag and box heels; for service, besides a pinafore inspired apron. “Whereas men will be paired in a formal three-piece suit inclusive of red waistcoats and white shirts. Laced up oxford shoes have been introduced keeping in mind the ease and comfort of the user,” it said. The range for the pilots’ squad includes a single button slim cut black suit for men. For the on-ground staff, women will be wearing a button back blouse in white and red polka dots with skirt suits in red, while the men will be in black slim cut single button suit with red trim detail on the white shirt collar. The FA outfits look great, albeit a bit short for Indian standards. Rather unsafe for the girls to wear such short stuff in a place where there are so many Indian blokes around. But overall, good work Spicejet. Breath of fresh air compared to the likes of Indigo and AI. It looks too chic, for me atleast. The UAE as a destination is a crucial part of SpiceJet’s expansion strategy, says Ajay Singh, the airline’s chairman and managing director, as it looks to stay profitable just two years after the budget Indian airline was on the brink of collapse. Mr Singh wants to increase flights from India to Dubai by 50 per cent – to 15 flights a day within a few months from its current 10 daily flights. "Now there are negotiations going on between UAE and India to increase some of the flying rights between the two countries and we expect that will happen very soon," he said. "We already have the landing slots in the airport in Dubai and take-off positions and so on, so as soon as the bilaterals are done we’ll be able to [start the new flights]", he said, adding that the rights should take about two to three months to come through. The company is planning to launch flights to Sharjah this year, although a date has not yet been fixed, Mr Singh said. Muscat in Oman is another Arabian Gulf destination it plans to start flying to. Flights will increase to daily effective 10MAY17. Spicejet will terminate Chennai-Bangkok effective 14APR. A Spicejet Boeing B737-800 aircraft will have TATA Hexa – the latest vehicle from Tata Motors being advertised on its fuselage. Pictures of this aircraft started circulating on social media early this week. VT-SLL was inducted by the airline in July 2016. The aircraft was operated by Brazilian carrier GOL since 2007. The 10-year-old aircraft has been leased from BBAM. Low Cost carrier Spicejet announced the launch of its seventh International destination with flights between Kolkata and Dhaka – the capital of neighbouring Bangladesh. The new daily flights will be effective 23rd March 2017 and operated by Bombardier Q400 aircraft which seats 78 passengers. Hajrat Shahjalal International Airport at Dhaka is the biggest airport in Bangladesh and tops the passenger and cargo handled. Spicejet will be the eight airlines to operate this route. The Kolkata – Dhaka route is competitive and busy with a daily flight by Air India, Jet Airways, Regent Airways and US-Bangla Airlines. Air India Express and Novo Air operate less than 7 frequencies a week. Biman Bangladesh – the Bangladeshi national carrier operates 12 flights a week and is frequency leader in the market. IndiGo has announced that it would launch flights to Dhaka but neither has it opened bookings for its flights nor has it confirmed if the flights will be from Kolkata. Nice short article, and nice history and analysis as well, with a lovely picture by ace lensman Prathamesh Kini! What is interesting is that the Tatas are not advertising the Hexa on their own airlines: at least, on the exterior, though they have aggressively targeted media, and there was one on display at IGIA Delhi as well. The Aria did not do well owing to it being over-priced for its features. I hope the Hexa does better: this is a nice design. Sir, thanks for a nice article, as always. This is an over-loaded market, and the careful entry by SpiceJet is with perhaps the aircraft type best-suited for the ops: a fast turboprop, offering more economy than a B738/9, while being cautious on the seats in this huge capacity-low-yield market, which also sees a bloodbath between carriers. Chittagong will be interesting, since the Bangla carriers have a real stronghold on the route. I also appreciate the tongue-in-cheek part about the spelling of the official name of the airport: Bongs pronounce `Hazrat' as it as you have written it. After Air India, now SpiceJet has also decided to reserve a row of seats for solo women travellers. The low-cost carrier said that from Wednesday - which happens to be International Women's Day -- it will have the fourth row of its Boeing 737s and Q-400s reserved for women flying alone. "In case of a full flight scenario, males will be assigned window seats; whereas the aisle and middle seats (B, C and D, E) will be assigned to women on a first-come-first-serve basis. The special seating arrangement is being catered to offer more ease to the solo female travellers, as moving out of the middle or the aisle seats is much easier thereby ensuring safety and comfort to them in case of an emergency and even otherwise," SpiceJet said in a statement. SpiceJet will shortly foray into India’s highly competitive retail space with plans to set up a string of physical stores, online e-tail gateways, and in flight merchandise, selling a range of consumer goods from fashion products, gadgets and electronic items to, eventually, food. The company will sell its own brand of products sourced from hundreds of vendors across the country and overseas, top sources, who did not wish to be identified, told Moneycontrol. A special line of brands have been created for each product category under the umbrella “Spice” brand, which the company is currently finalising. A separate subsidiary of airline’s holding company is being created for the retail venture, which will be run by a completely different team maintaining arm’s length distance with the airline’s operations, sources indicated. A formal announcement on the retail venture is expected within a month. A company spokesperson declined to comment for this story. The physical stores, which will initially come up in airports, will be completely owned and run by the company, selling hundreds of products under the single umbrella brand. The online stores will function on “e-tail” principles, where the company will hawk products directly to consumers through a dedicated portal. The airline’s retail venture will not be an aggregator like Flipkart, Amazon or Snapdeal, where third-party sellers sell directly to shoppers through online portals. For instance, while customers can choose from different television brands through Flipkart, Amazon or Snapdeal, the airline’s online retail store will offer its own brand of televisions across multiple price ranges. This model will apply for all its products. “This will bring it in direct competition, not only with the online retail aggregators, but also with all major retail brands and direct selling companies,” the source said. SpiceJet Ltd will lease more planes to fly under the government’s Udan regional flying scheme and connect six additional stations, chairman Ajay Singh said in an interview. “There will be some planes required for RCS (regional connectivity scheme),” Singh said, adding that over the next one-and-a-half years, the airline could take on lease as many as 10 planes, some of them for this scheme. The flights under RCS could be to six stations, starting summer. “We should be starting RCS flights by June or July,” Singh said, adding that there would be single flights to these stations “and then we will see how it goes”. While Singh did not specify the stations to which the airline will fly, a government official who did not want to be named said the airline has sought routes mostly in north India. “They are targeting Punjab and Uttar Pradesh, stations like Kanpur, Agra among others,” the official said. In a bid to boost ancillary revenue and compete with full-service airlines, low-fare carrier SpiceJet Ltd may start offering in-flight Internet services to its passengers. The paid service could allow passengers to stream live movies and cricket on platforms such as Hotstar and Netflix besides help retain business passengers who may drift towards full-service airlines who are planning to offer a similar service. “We are seeing what all new things we can do to enhance passenger journey,” the chairman Ajay Singh said in an interview. “We should make the journey interesting and we should get ancillary revenue. The SpiceJet service will be paid, Singh said, and could be offered on its new planes. SpiceJet which currently has 49 planes, has ordered nearly 205 next-generation Boeing 737 Max aircraft. Of these, 155 will be delivered between 2018 and 2024. With airlines lobbying the aviation ministry, it has opened talks with other ministries to relax rules which obstruct such a service. “The telecom ministry is currently looking into the matter,” said an aviation ministry official who did not want to be named. One of the key reservations was the servers through which Internet traffic will be passing and how it will be kept under Indian jurisdiction for security oversight, the official said. SpiceJet from next month is launching its first international route from Thiruvananthapuram, as the airline opened bookings for Thiruvananthapuram – Male route. From 10MAY17, Dash8-Q400 aircraft will operate this route on daily basis. In fact from the same date, SG will increase Bengaluru-Vijayawada/Kochi, commence Bengaluru-Thiruvananthapuram as well. SpiceJet has added a pre-owned 737-800 to the fleet today, as VT-SLH. SpiceJet Ltd will start offering streaming movies, cricket and other content on all its flights beginning later this year, becoming the first Indian low-fare airline to do so. All 49 SpiceJet planes will be fitted BoardConnect Portable from Lufthansa Systems, which will store and wirelessly stream pre-loaded content to passengers’ Wi-Fi enabled mobile devices. Full service airline like Jet Airways and Air India already offer in-flight streaming content on some of their flights. SpiceJet, which charges passengers for food, baggage and preferred seating, did not say if it will charge for the streaming video service. The service will also be used to sell products on the flight. “SpiceJet expects to be the first LCC (low-cost carrier) in India to provide this unique entertainment and shopping experience to its customers,” Ajay Singh, chairman and managing director, SpiceJet said in the statement. BoardConnect Portable includes a server and access points in a single device called the Mobile Streaming Unit (MSU). About the size of a conventional tablet, it can be mounted or removed without affecting other components in the aircraft, for example in the galley. An integrated modem allows rapid wireless updates of content while the aircraft is on the ground. In the past, airlines used to install in-flight entertainment systems connected with long wiring behind the back of each seat, which were expensive to maintain. India’s low-cost carrier SpiceJet later this month plans to expand service to Bangladesh, through the introduction of 2nd daily Kolkata – Dhaka flight. The new flight departs at afternoon/evening hours, will begin on 16MAY17. Dash8-Q400 aircraft operates this route. Telangana Tourism broke new ground on Tuesday when it became the first Tourism department in the country to take its promotional activities to the skies. The innovative promotion comes in the form of an aircraft wrap, which will be displayed on a Boeing 737-800 jet of private domestic airline Spicejet. The campaign, which begins with a flight at 4pm on Tuesday will be for two months, with the aircraft slated to touch down at seven to eight airports across the country every day. Tourism Minister A. Chandulal unveiled the aircraft with the wrap, which has the Qutb Shahi Tombs and the Golconda Fort on one side and the Falaknuma and Chowmohalla Palaces on the other. Spicejet is now officially commencing Patna effective 01JUL, with daily flights to Chennai (via Hyderabad), Surat (via Kolkata) and Mumbai, as well as 6 weekly flights to Bengaluru and Tuesdays-only nonstop to Chennai. Flying to western Europe for a summer break may not remain just a dream if SpiceJet's plans for medium to long haul international flights work out. The low cost carrier (LCC) is currently working out the economies of this model and says return fares could be about Rs 25,000 to places like London, Paris and Amsterdam in all-economy seating wide body aircraft. Return fares on these sectors is mostly upwards of Rs 40,000 on full service Indian and foreign airlines, especially in peak travel seasons. This January SpiceJet had placed an order for up to 205 Boeing aircraft — 155 B-737 and an optional order for 50 more that was a mix of wide and narrow body planes. "We are evaluating the low cost long haul model for which an optional order for wide body planes has been placed. There is a good market for this segment in India if a good product is offered at the right price. Imagine the demand that a fare of Rs 10,000-15,000 on Delhi-London will have," SpiceJet chairman Ajay Singh had said on January 13 while signing the deal with Boeing. The airline has made headway with those plans and shared some key features with TOI. "SpiceJet will follow the same low cost/no frills model on its long haul routes as it does on its domestic and short haul international sectors where passengers pay for additional services like meals, seat selection, priority check-in, priority boarding and excess baggage. However, unlike some other international LCCs, the first (check-in) bag would be free of charge," said a SpiceJet official. "SpiceJet plans to have 350-380 seats on a Boeing 787 Dreamliner. It would be an all-economy class configuration with few select rows of SpiceMax seats offering extra leg room. 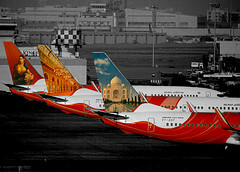 Full service Air India has 256 seats on its Dreamliners with 18 in business class. (With this seating capacity) if we can cap return fares at levels of about Rs 25,000, many would prefer a European vacation when a domestic return ticket can cost the same during peak season," said another SpiceJet official, adding that the LCC is looking at London, Birmingham, Paris, Amsterdam, Frankfurt and Zurich as the possible destinations. It will offer in flight entertainment on its flights from later this year. The airline did not give a firm date for starting these flights. "SpiceJet continues to study the viability of low-cost long haul travel and a decision will be taken in due course," said Ajay Singh. For some reason I was hoping that Indigo would start the long haul low cost carrier. That said, with fares so low already, will Spicejet be able to really offer lower fares than EY, TK and the like? SpiceJet in the second-half of summer 2017 season is adjusting operational frequencies to Afghanistan, where it currently serves Delhi – Kabul route 5 times a week. From 01JUL17 to 28OCT17, overall service will be reduced to 3 weekly, on board Boeing 737 aircraft. SpiceJet has added a 737-800 on lease from Nok Air to the fleet today, as VT-SLI. SpiceJet has added a new Q400 to the fleet today, as VT-SUV. Low cost carrier Spicejet has lately been in the news for the proposed long haul operations. The airline has been silently transforming itself on the technology front, after coming out of near bankruptcy two years ago. Mumbai International Airport Limited (MIAL) partnered with global technology service provider SITA to introduce the self bag drop system – Scan&Fly at Terminal 2 followed by Terminal 1 used by low cost carriers for domestic flights. Spicejet is the first airline to integrate its system with the Scan&Fly setup and offer its passengers the service to self check-in and self bag drop. The system lets the passenger search their PNR (Passenger Name Record) and has the ability to calculate the dimension of the bag along with its weight before printing out the baggage tag. The passenger is expected to attach the baggage tag to the bags and keep the baggage receipt for reference. SpiceJet has added a new Q400 to the fleet today, as VT-SUW. SpiceJet has added a new Q400 to the fleet today, as VT-SUX. Is this SpiceJet's approval for dropping "Viceroy Territory" tag? Boeing and SpiceJet today signed a memorandum of understanding for 40 737 MAX airplanes. The agreement, valued at $4.7 billion at current list prices, is split evenly between 20 new orders for the 737 MAX 10 and conversions of 20 of the low-cost carrier's 737 MAX 8 airplanes from its existing order to 737 MAX 10s. The order will be posted to the Boeing Orders & Deliveries website once finalized. "As a Boeing 737 operator and current customer of the 737 MAX, we are proud to be a part of the launch of the 737 MAX 10 and to be the first airline in India to order the newest version of the 737, which will enable us to maximize revenue on our dense routes while having a lower unit seat cost," said Ajay Singh, Chairman and Managing Director, SpiceJet. "With the introduction of our 737 MAXs next year, we will be able to further expand our network, while keeping our costs low for our customers." SpiceJet operates a fleet of 35 Next-Generation 737s and 19 Bombardier Q400s. The carrier plans to grow its operational fleet to 100 airplanes by 2020 and looks to expand regionally with the new 737 MAX family of airplanes. SpiceJet will take delivery of its first 737 MAX in 2018. "SpiceJet continues to be an aviation leader and strong Boeing partner, and we are honored to have them join 737 MAX 10 launch group," said Boeing Commercial Airplanes President & CEO Kevin McAllister. "The additional 20 737 MAX 8s and capacity provided by these 20 new 737 MAX 10s will allow SpiceJet to offer even more passengers their award-winning on-board experience, while the airplane's efficiency will keep SpiceJet profitable." How does the Max 10 compare to the 321 NEO and 321 NEO LR?